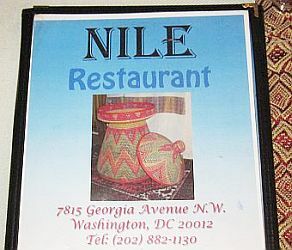 The Nile Restaurant offers Ethiopian cuisine at 7815 Georgia Avenue, N.W., Washington, DC 20012. There is plenty of parking around the restaurant. A small courtyard on the side of the building has several tables where customers can dine outdoors. 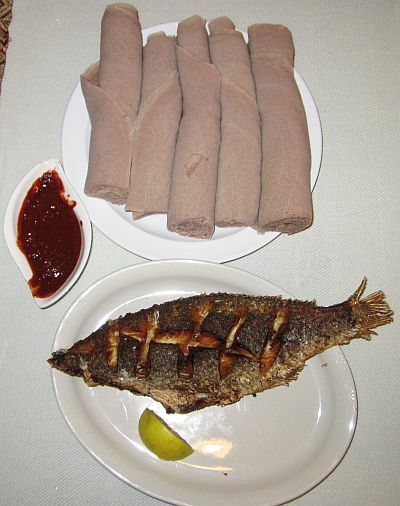 The restaurant shares a front entrance with a small market that sells Ethiopian breads, spices and other goods. The interior of the Nile Restaurant is clean and modestly decorated with small souvenirs from Ethiopia on the walls. The tables are covered with glass tops protecting tablecloths with fringes embroidered with Ethiopian motifs. 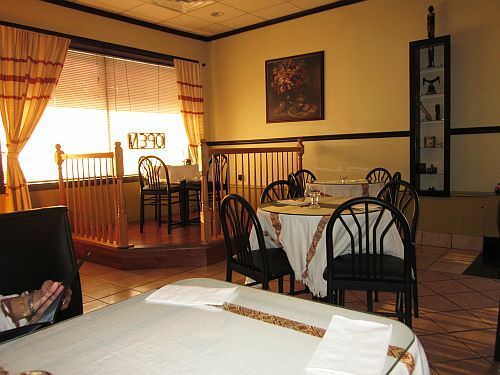 The first impression when you enter the restaurant is the smell of coffee and a faint fragrance of incense. A small bar in the back of the restaurant has several tables where Ethiopian patrons gather and converse in Amharic, the official language of Ethiopia. Immediately, you get the feeling that you have been transported to the horn of Africa. The menu offers a variety of appetizers such as Azifa which is a lentil salad seasoned with herbs and spices, as well as vegetable and beef sambusas. The Beef Sambusa is a thin dough shell stuffed with a blend of minced beef, green chili and herbs deep-fried in vegetable oil to golden crispiness. The Vegetable Sambusa is filled with lentils, onion, hot green peppers and herbs. 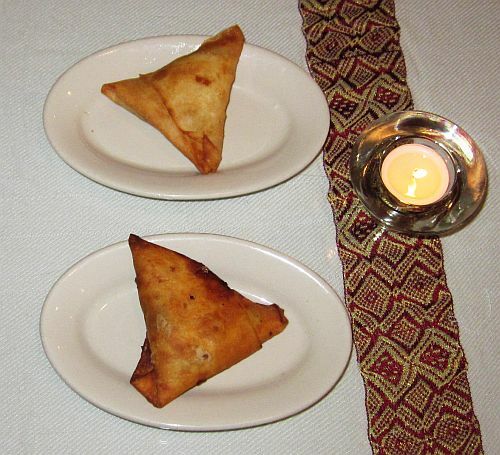 I tried both sambusas and they were piping hot, crispy and tasty. The Nile restaurant has tibs entrées that include Lega Tibs, Derek Tibs, Tibs Fifit and Zil Zil Tibs. 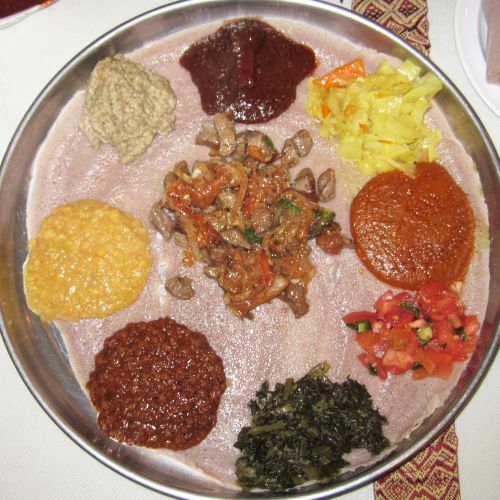 These are all dishes of beef or lamb cubes marinated in different spices and made into stews that are served on top of injera bread surrounded by various vegetable side dishes. The Lega Tibs consist of tender cubes of lamb or beef sautéed in flavored butter with onions, rosemary, tomatoes, green jalapeños and other Ethiopian seasonings. Mitten Shiro - Ground chickpeas cooked with fresh garlic and herbs. Misir Wot - Lentils prepared in a special blend of Ethiopian spices. Alicha Wot - Yellow split peas prepared with turmeric sauce. Gomen - Collard greens simmered with garlic, onions and jalapeños. Atikilt - A mix of vegetables simmered with onions, garlic, ginger, fresh herbs and Ethiopian spices. Misir Azifa - A salad of green lentils, onions, chopped jalapeño pepper seasoned with ginger, garlic, pepper, lemon and mustard seed. Timatim Selata - Ethiopian style salad: tomatoes, onions and jalapeño pepper mixed with lemon and Ethiopian spices. 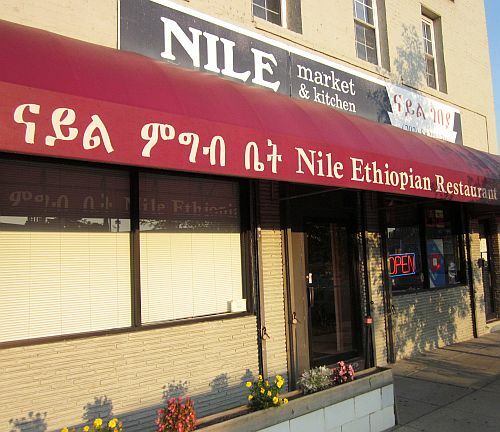 Overall, the experience of eating at the Nile Restaurant was very pleasant. The service was good, the food was excellent, the prices were very reasonable and the ambience seemed authentically Ethiopian.